Our office focuses on building excellence in research through supporting the recruitment of excellent faculty and students, facilitating faculty development in research/scholarship, improving infrastructure and processes, translating research into new products and companies, and fostering partnerships and collaborations. This year NC State faculty and research administrators submitted 3,425 proposals valued at $1.31B in total funding requests. NC State received $405M in extramural research awards, a historical high, to be dispersed over multiple years to 2,830 projects. The Proposal Development Unit (PDU) supported the development and submission of 44 large-scale, interdisciplinary team proposals that resulted in $29.9M in awards with another $102.3M requested still pending. 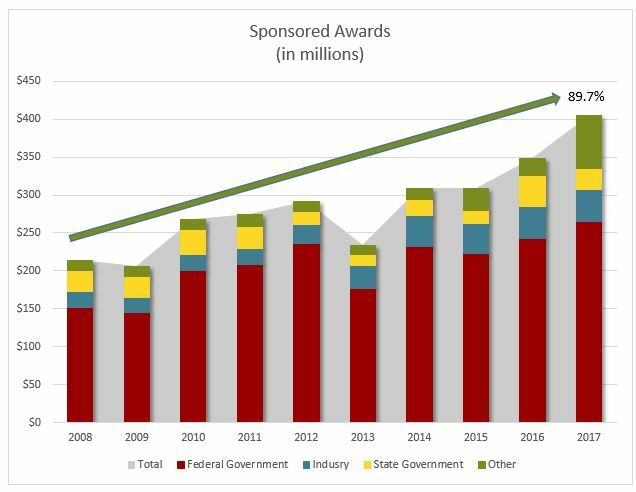 Since 2008, NC State total research awards have increased by 89.7%. All time records were also achieved in technology commercialization and innovation with 169 licenses and options agreements executed and 15 new start up companies launched. All of this was achieved while NC State continued to strengthen its partnerships with the public, government, and private sectors. This year Centennial Campus Partners opened 13 new offices bringing the total number of Partner employees on campus to 4610, a 29% increase from last year. The Office of Partnerships and Economic Development (OPED) facilitated the signing of a Memorandum of Understanding (MOU) between NC State and the City of Raleigh to collaborate on smart city initiatives. OPED also assisted in 60 North Carolina economic development projects, an increase of 20% from the previous year.